With views over Pagasitikos Gulf and Mount Pelion, these traditional guest houses in Makrinitsa offer rooms with fireplace and jet showers or spa baths. They are set in two 19th-century mansions. Each of the traditionally decorated rooms of the Guesthouses Saltis features wooden floors, iron beds and handcrafted carpets. Room service is available. Wi-Fi is free throughout the premises. Guests may enjoy a homemade, traditional breakfast at the Saltis Guesthouses� spacious dining room. During the day the inviting lounge with fireplace and TV may serve as the perfect spot for relaxation. 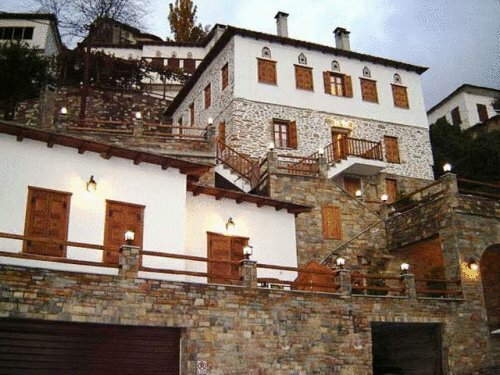 The Saltis is 15 km north of Volos and 12 km from the Pelion Ski Center in Chania. There is free on-site parking.